During a recent business trip to Brussels, I went through my normal routine. I checked Trover on my smartphone (I wont go into it now, but check it out if you haven’t already) during my taxi ride from the airport to my hotel and once I was at the hotel, I checked-in at the property on FourSquare. I do these two things where ever I go for a number of reasons. Primarily, I like sharing where I am with you all, but I also like to see if any hotels I visit interact with me on social media. I have to admit, I don’t experience interaction very often and when I do, it comes across a little half-hearted. 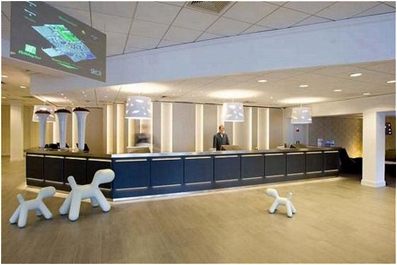 When I checked-in at the Holiday Inn Brussels Airport, I was to be pleasantly surprised. After a couple of very welcome beers in the hotel bar with a colleague, I checked my phone and saw on my Twitter feed that the hotel had responded to my check-in and welcomed me – nice touch. A simple response makes the world of difference to a guest, especially a first time guest. A Twitter conversation followed and I could clearly tell that the hotel really had a social media strategy, and they were keeping it simple. Take the chance to interact with the guest – the guests made the first move by checking in on FourSquare, or tweeting the hotel – it’s up to the hotel to respond and add value to that social platform. It’s the small things that make the world of difference. I also like the fact that this property encourage interaction. 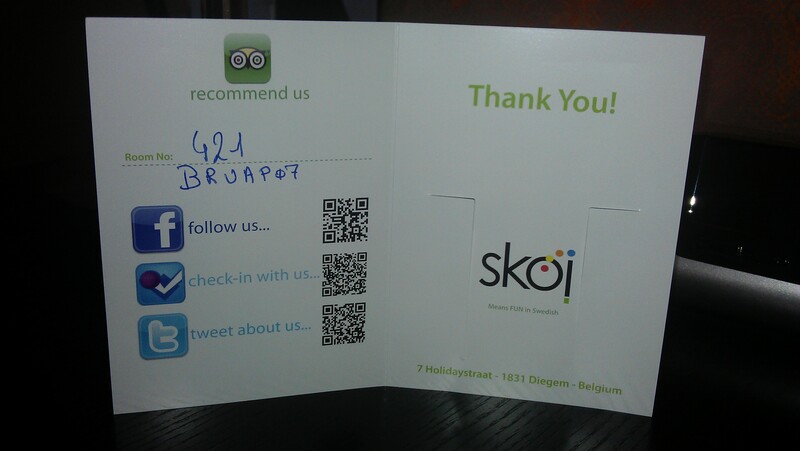 Okay, I am a hotel and social media geek, so I was always going to check in – but they prompt their guests to do it – by interacting of Facebook, FourSquare and even to leave a review on TripAdvisor by putting their message on their room key inserts using QR codes. Pleasantly surprised, I thought that was it. But the next evening when I returned to my room I was to find the hotel really going the extra mile. On the floor was an envelope, with a handwritten note from the General Manager, thanking me for my social interaction, and giving my two complimentary drinks at the hotel bar. Not only was this unexpected, but it was a fantastic effort from the hotel. this truly is how channels like FourSquare, Facebook and Twitter should be used – this is how to make a guest feel wanted, and make them want to come back. 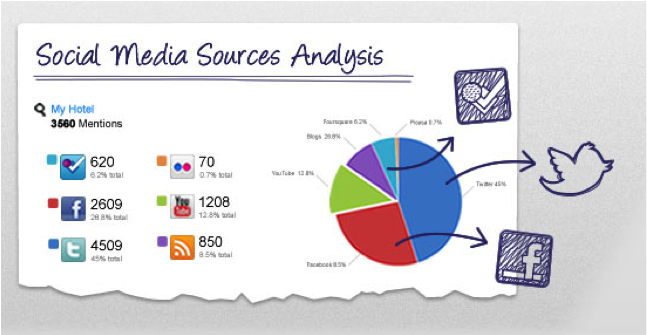 It’s the small efforts of a hotel with a clear social media strategy that make them stand out from the crowd. Let’s be very honest – an airport hotel from a major chain like Holiday Inn – they are all the same (to most guests minds anyway). In fact, even to me, I would not have expected this welcome and treatment from an airport hotel. I know that IHG (the owning company of Holiday Inn) have a clear social strategy and encourage and give creative licence to their properties, but this is the first time I had experienced this kind of interaction, so I felt a post was just reward. 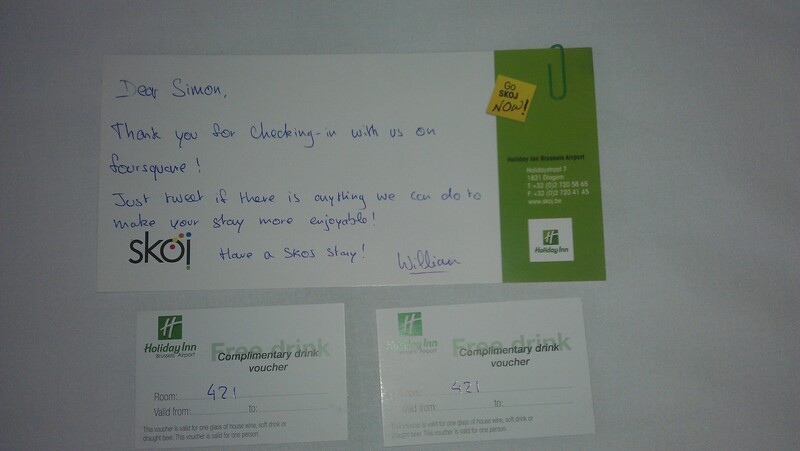 Thank you Holiday Inn Brussels Airport – I’ll come back to you next time I’m in town – you won a loyal fan! Some hotel chains are only just waking up to the fact that social media channels equal booking channels. Some are only just realising it could be an idea not to just have a presence on Facebook, but to let clients book on Facebook. Accor have been ahead in the game for a while now, and this week announced that they had the first location-based application to reward a hotel group’s loyalty program members. 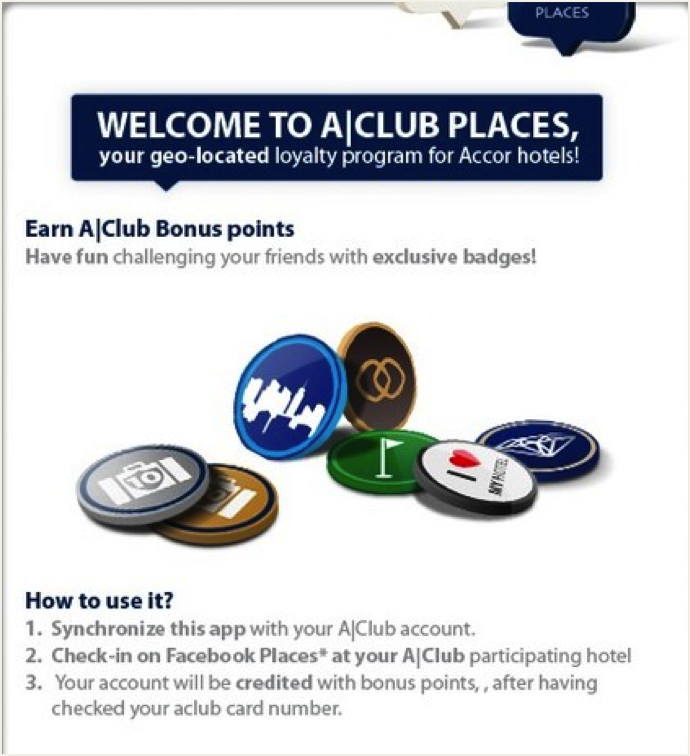 Accor launched A-Club Places, an innovative and unique Facebook application, available to A-Club loyalty members. The launch of this application is part of Accor’s strategy to develop its presence on the Internet, on mobile phones and social networks. Sales through these direct distribution channels represent close to 29% of the Group’s total sales. The new service allows members to check in on the application on Facebook and rewards customers with a badge depending on the regularity of their stay and on the type hotels the stay at which convert into A-Club points. 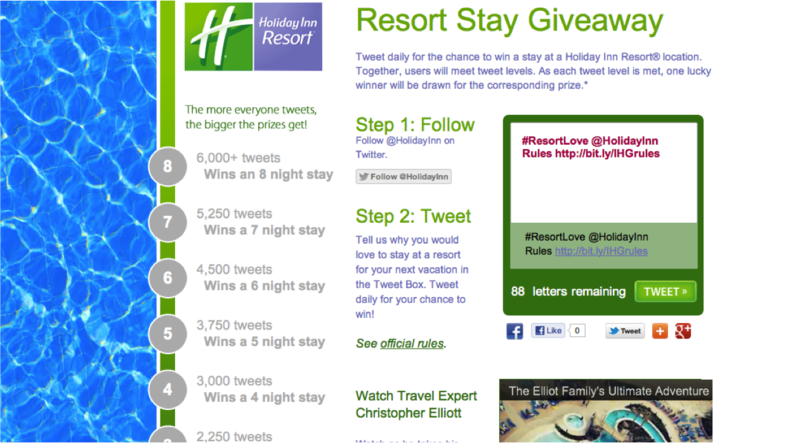 This just shows how hotels are having to develop their online presence in social circles even more carefully. Its important to offer as much of your baseline service on as many channels as possible, and Accor have plugged the gap with their loyalty program. Outside of Hotel Insight, my role in the hospitality industry allows me to get really involved in the Irish market, and for that reason, I was speaking with my friend Christina, the owner of CG Online Marketing based in Ireland, about her thoughts on hotels using social media in her primary market. We had such a good conversation, that Christina offered to provide her insights into this area – so this post is courtesy of Christina! Christina: “According to Failte Ireland’s visitor survey, everybody loves the Irish hospitality. In my mind, this means that the Irish charm and warm nature is perfect for social media – so here I’ve compiled a list of the top Irish hotel social media pages and campaigns and together we can you can judge if the Irish brand of hospitality translates as well online. A stunning location on the south-east coast and close to Ardmore Bay, the Cliffhouse Hotel are lucky to have the ocean as a backdrop. These guys were born to tweet and never miss a chance to respond (great customer service). Practically 4000 Twitter followers and high engagement levels. They have been known to tweet and serve simultaneously. Their Facebook page is just as busy – plenty of pictures, updates and they even shared a few mentions on third party blogs – nice! Not one question was left unanswered and the tone was consistently upbeat. Set on the outskirts of Dublin city, the Clanard Court is a popular local for those living in Athy. (the one of your dreams, of course). Fans had to guess the couples. What I loved about this campaign was the innovation and personalisation of it. Interactive, multimedia-driven (upload images and video interviews), personality (some cool questions like ‘What celebrity does your partner look most like?’) and the amount of time and commitment a campaign of this magnitude must have taken. This is more of a free-fall into social media, as opposed to a side-step and it is a testament to what social media can do for a hotel. The Maryborough hotel (a client of mine, incidentally) is well-known for a warm and friendly service. They are constantly adding to the hotel (Pet Farm, Team Building and Dome) and are dedicated to their guests. The Facebook page has personality! Sales carries this function and it’s updated almost daily – sometimes with offers, something with links, and sometimes a just a feel-good shout out. You may not note the strategy at play, in fact you might be forgiven for thinking there isn’t one at all…but, there is! The updates are all goal-driven – Talking about Santa’s visit, buying Christmas vouchers, Spa offers, etc. Mostly, there’s a sales message at play, but it’s packaged behind an energetic and happy voice, so fans respond. Plus – they use #tags for tweets and create a nice buzz for their offerings. There are countless hotels in Ireland worth a mention, like The Cork Airport Hotel – winner of a number of marketing awards and promoters of an edgy, creative vibe (vibrating seats – need we say more?) http://www.facebook.com/corkinternationalairporthotel, plus The Burlington Hotel in Dublin http://www.facebook.com/pages/The-Burlington-Hotel-Dublin/102643726883 where every status update gets a picture (for those not in the know – this increases your chances of being seen by your fans). Christina is owner of CG Online Marketing (www.cgonlinemarketing.com) and has ten years experience in online marketing communications from working with Premier Recruitment Group, LA Fitness, Monarch Airlines, Thomson Travel and a host of other companies. Christina is dedicated in providing unique online marketing solutions tailored to individual client needs, and ensuring that all online activities run smoothly and obtain the best ROI possible. Specialties:Online marketing Online media Social Media/Social Marketing SEO / PPC Google analytics (qualified in GA IQ) Web trends + insights, Data segmentation and targeting, Customer Behavior analysis, Digital design, Writing, Ethical marketing Green marketing / Sustainable tourism and Hotel + travel online marketing. In such a competitive marketplace, hotels have to stand out from the crowd, not only to attract customers, but to retain them, whilst ensuring that they not only come back to stay with you, but pass a good story on to their friends. Using social media channels is the perfect way to create a connection with a prospective guest or customer, but this has to be thought about clearly. 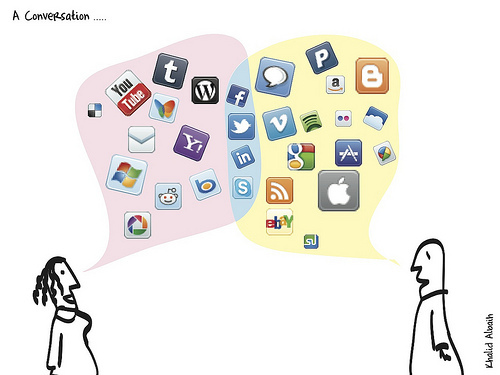 Too often I see hotels mis-using social channels and instead of conversing with customers, they frustrate them and drive them away from connecting. Twitter is at the very heart of this. Hotels that purely send out special offers and promotions quickly find people hitting the unfollow button. Twitter should be about creating a personality for your hotel or brand and engaging with people, and making sure they know what you’re doing. For me, there is one perfect example of how hotels have been inventive with Twitter and done exactly that, and it’s the Hyatt Concierge. Hyatt have been very clever and even been the pioneer of the online concierge service. Quite simply, they have created a Twitter account called @HyattConcierge as a way to interact with guests and provide all the services of the hotel concierge desk over Twitter. And it’s working fantastically well. 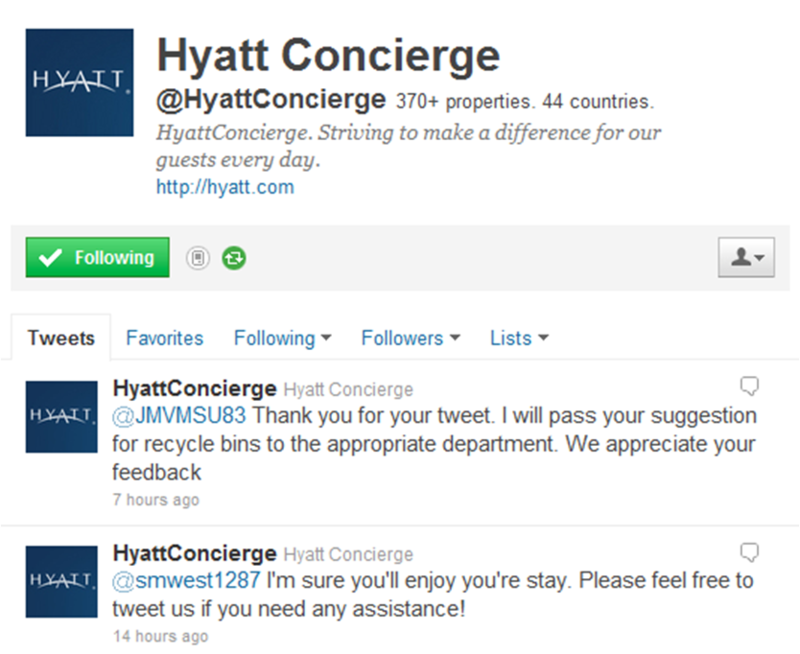 With over 16,500 followers, you can see guests interacting with Hyatt on all kinds of levels. From recommendations for restaurants nearby to their hotels, to post check-out comments on service and suggestions. This has opened a whole new way for guests to communicate with Hyatt. Remember, this is not new. I’m not telling you about a brand new concept. This account has been in existence for a number of years and is widely used. It just goes to show that you can truly add value to your guests experience in such a simple way. Think outside the box, think about what you customers want, then find a way to do it – before they disengage altogether.